A few weeks ago we brought you the news that Ford had offered up a 1 of 1 2014 Mustang Cobra Jet and with the Barrett Jackson Auto Auction that featured that special race car has run – the unique orange Cobra Jet Mustang has raised $200,000 for the National Multiple Sclerosis Society. The 2014 Ford Mustang Cobra Jet drag package is not offered in the striking matte orange shown in the image above but the folks at Ford Racing used this prototype Mustang race car finished in the unique orange hue to raise big money for charity. In addition to the unique paint and all of the standard components that make the 2014 Cobra Jet one of the fastest Mustangs ever sold by Ford Motor Company like the supercharged 5.0L V8, a T4 racing transmission, a 9 inch Ford rear end and 3 link rear suspension - this particular Cobra Jet wears a serial number to emphasize the special nature of this car - 2014BJMSCJXX1. That translates to 2014 Barrett Jackson Multiple Sclerosis Cobra Jet XX1. The sole downside to the 2014 Ford Mustang Cobra Jet drag car that was auctioned off at the Barrett Jackson Auto Auction is that - like all Cobra Jet Mustangs – it is not street legal. However, when you consider the fact that most of these super high priced collectable performance cars don’t see much street use even when they are street legal, the inability to drive this car on the street isnt that big of a deal. In the long run, it wouldn’t have been that much of a problem to the winner who paid nearly a quarter of a million dollars for this unique Mustang. The auction action for this unique 2014 Ford Mustang Cobra Jet started fast and furious and when the final gavel came down – the winning bid was $200,000. The proceeds of this auction go entirely to the National Multiple Sclerosis Society so not only does the winner get to take home an incredible piece of Ford performance history, but he or she is also able to feel good about making such a substantial contribution to a good cause. To make sure that the person taking home this unique 2014 Mustang Cobra Jet knows how to handle it should the car participate in racing action (rather than just serving as a giant collectable), the winner gets to attend the Roy Hill Drag Racing School for a detailed course on how to go very, very fast as safely as possible. Finally, the winner also receives a rare chance to visit some of the most classified areas in Ford’s universe including an in-depth tour of the Ford Product Development Center and a visit to the Ford Design Studios with Mustang Chief Engineer Dave Pericak serving as the tour guide for this behind the scenes look at the birthplace of so many legendary Ford vehicles. 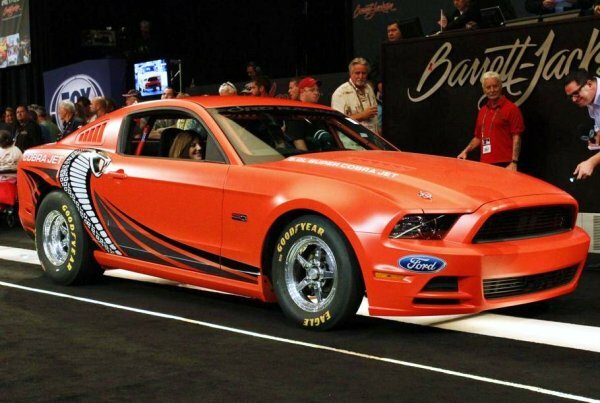 Neither Barrett Jackson nor Ford Motor Company have announced who the lucky buyer of the only orange 2014 Ford Mustang Cobra Jet is but with just 50Cobra Jet Mustangs built each year and only 1 painted orange and wearing that unique VIN – this likely won’t be the last time we hear about the matte orange 2014 Cobra Jet race car.